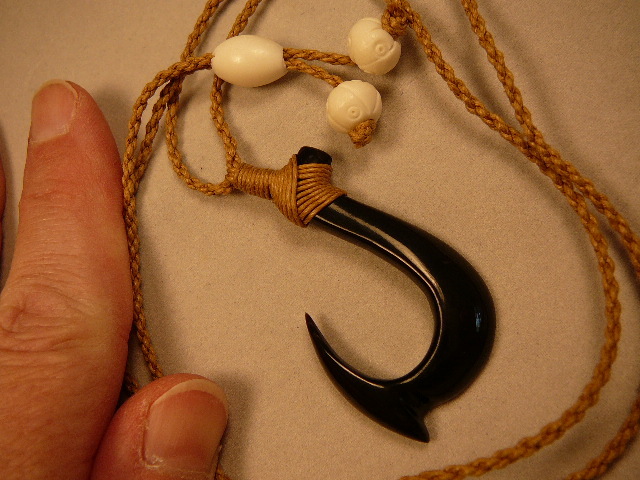 in the traditional Maori fish hook called Hei Matau. 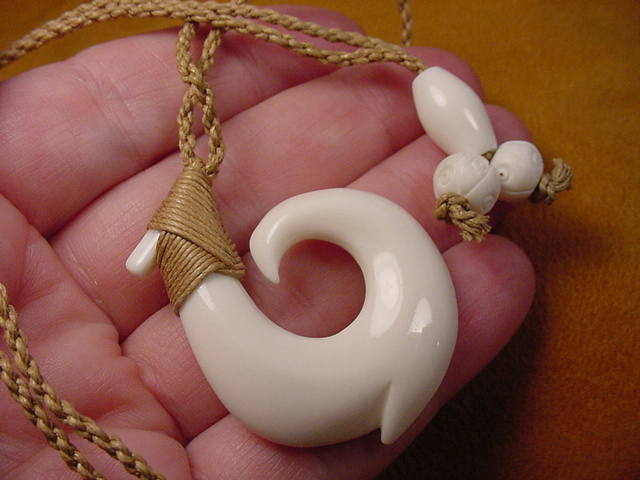 This shape represents strength, prosperity, abundance and fertility. 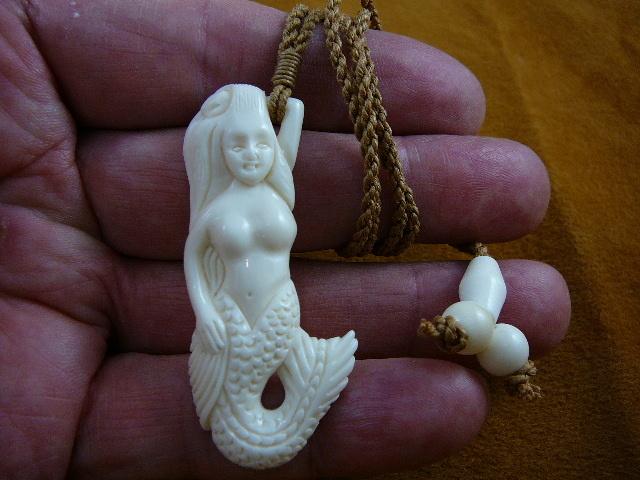 Wearing it is a sign of respect for the sea and its creatures, so it is also regarded as a good luck charm providing protection and safety while traveling over water. It is also given as a mark of friendship and respect. 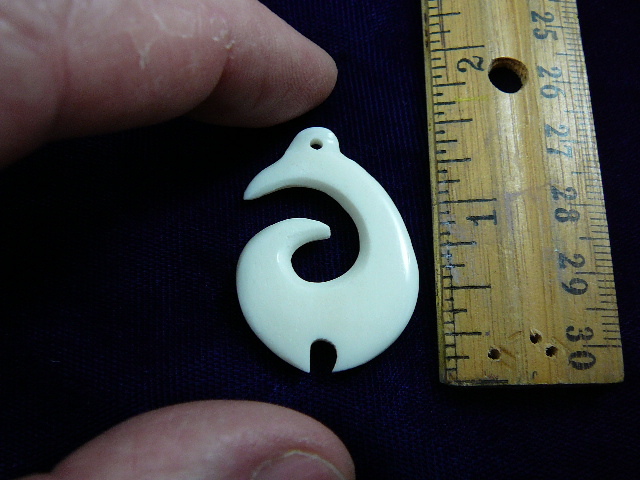 The Maori people of New Zealand are the oldest known culture renowned for these graceful designs, though these are carved in the Philippines with the same beauty & quality. (same on both sides) is 1-3/8" long x 1-1/8" wide, beautifully wrapped, on a 28" natural braided cotton cord necklace with bone bead adjustable sliding knot to any length you need. 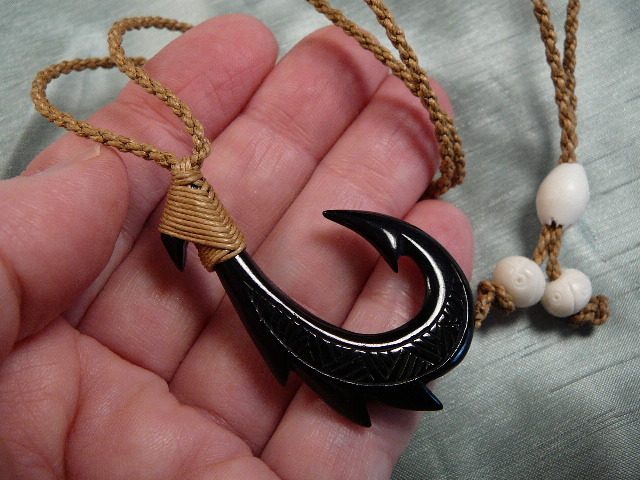 Hook and necklace are woven together, not detachable. (Same as #MA-02 above but larger). (same on both sides) is 1-3/8" long x 1-3/8" wide, beautifully wrapped, on a 28" natural braided cotton cord necklace with bone bead adjustable sliding knot to any length you need. 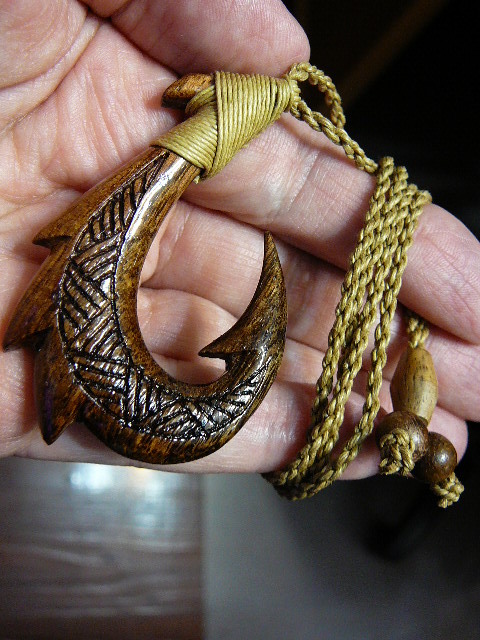 Hook and necklace are woven together, not detachable. Petite (same on both sides) is 1-3/8" long x 7/8" wide, beautifully wrapped, on a 28" natural braided cotton cord necklace with bone bead adjustable sliding knot to any length you need. 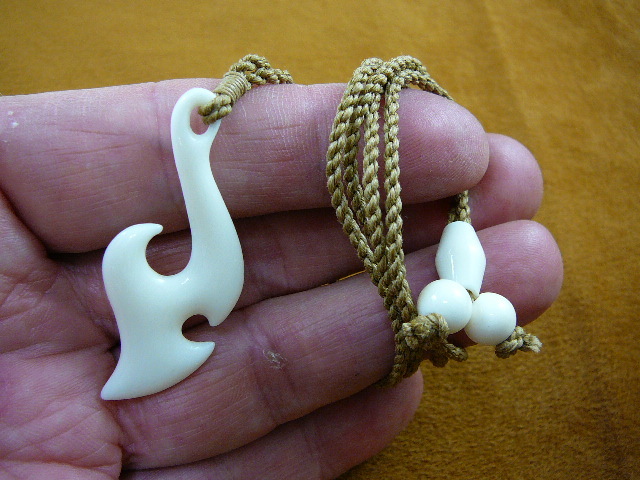 Hook and necklace are woven together, not detachable. 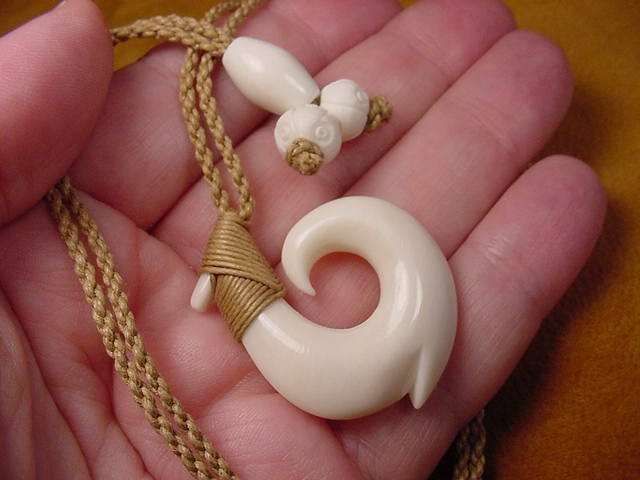 Hook (same front & back) is 2-1/8" long x 1-1/4" wide, beautifully wrapped top & bottom, on a 28" natural braided cotton cord necklace with bone bead adjustable sliding knot to any length you need. Hook and necklace are woven together, not detachable. 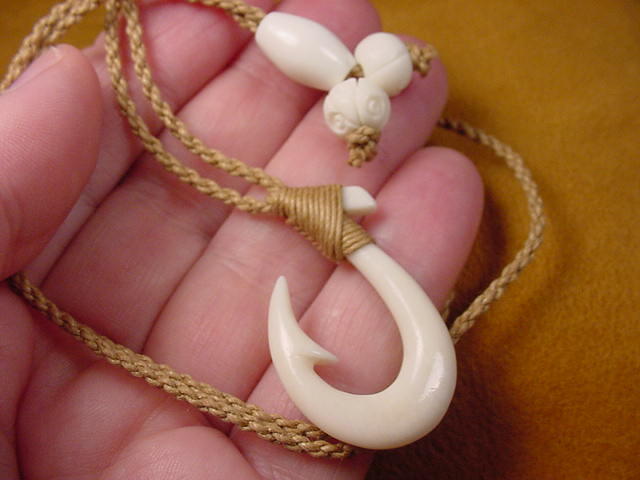 (front has a hatch design, back is also rounded but not carved except a decorative "J" initial from the artist, hook has three fins) is 1-7/8" long x 1-1/8" wide, beautifully wrapped, on a 28" natural braided cotton cord necklace with bone bead adjustable sliding knot to any length you need. 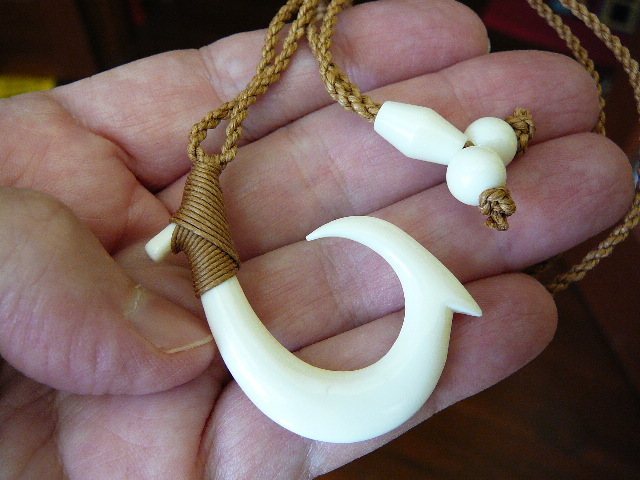 Hook and necklace are woven together, not detachable. 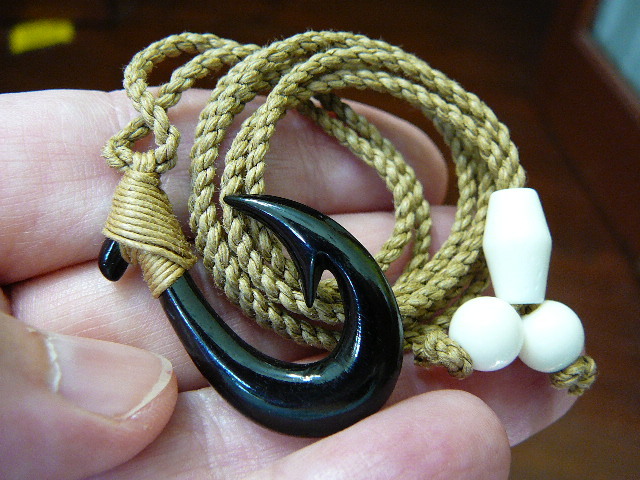 Black hook (water buffalo horn, back is concave & smooth) is 1-7/8" long x 1" wide, on a 28" natural braided cotton cord necklace with bone bead adjustable sliding knot to any length you need. 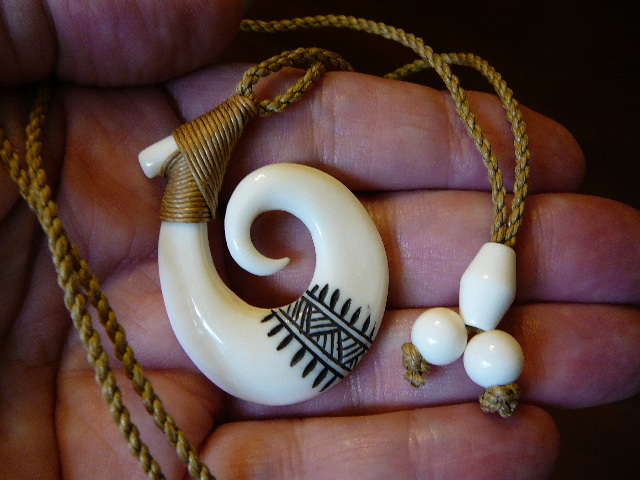 Hook and necklace are woven together, not detachable. 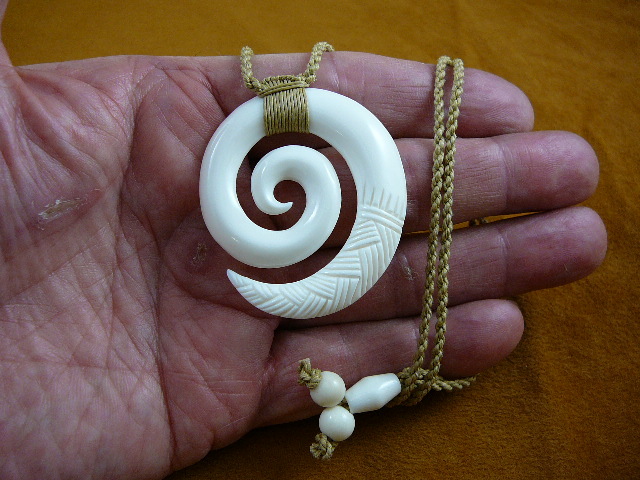 Back is rounded & smooth; on a 26" natural braided cotton cord necklace with bone bead adjustable sliding knot to any length you need. Hook and necklace are woven together, not detachable. 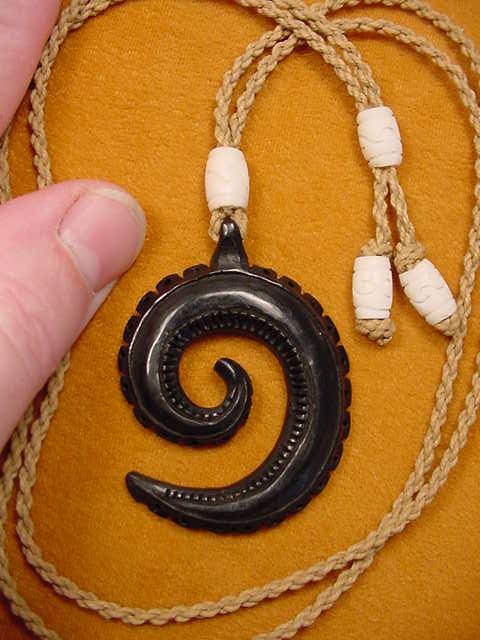 Etched design on the front, (smooth on back with a J signature), hook itself is 1-7/8" long x 1-3/8" wide, beautifully wrapped on a 26" natural braided cotton cord necklace with bone bead adjustable sliding knot to any length you need. 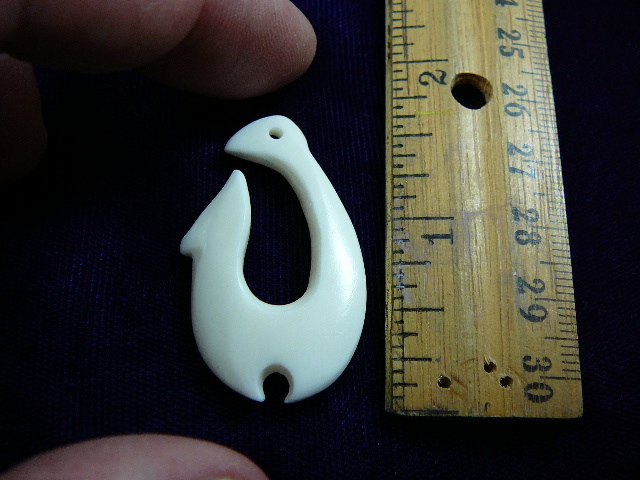 Hook and necklace are woven together, not detachable. 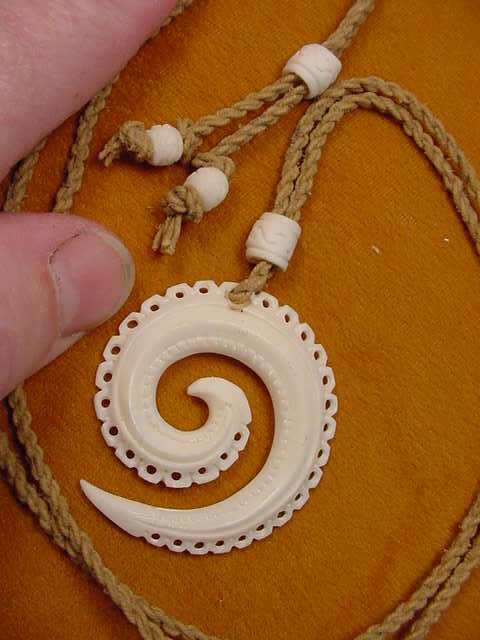 2-1/2" long x 1-1/8" wide, natural cow bone with flat/concave on back, specially wrapped on a 28" natural braided cotton cord, adjustable white bone beads to any length you need. 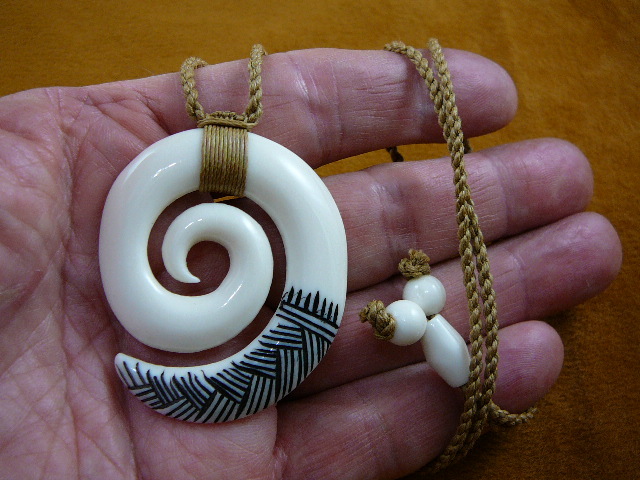 Hook and necklace are woven together, not detachable. 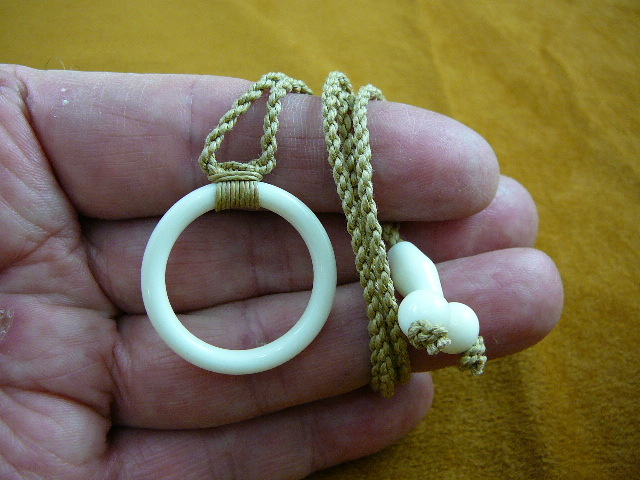 3" long x 1-1/4" wide, natural cow bone with flat/concave on back, specially wrapped on a 28" natural braided cotton cord, adjustable white bone beads to any length you need. 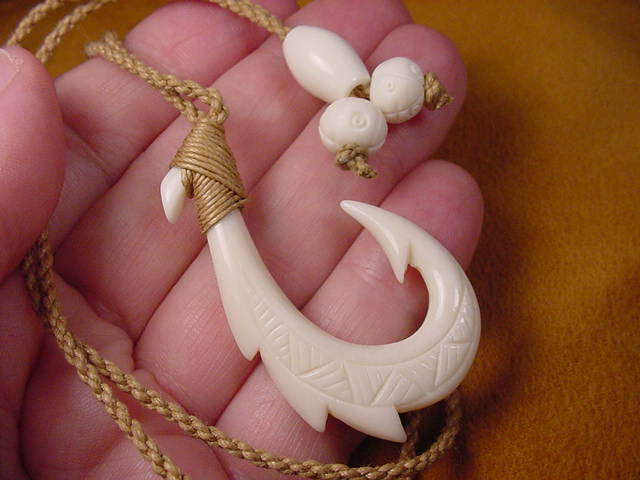 Hook and necklace are woven together, not detachable. 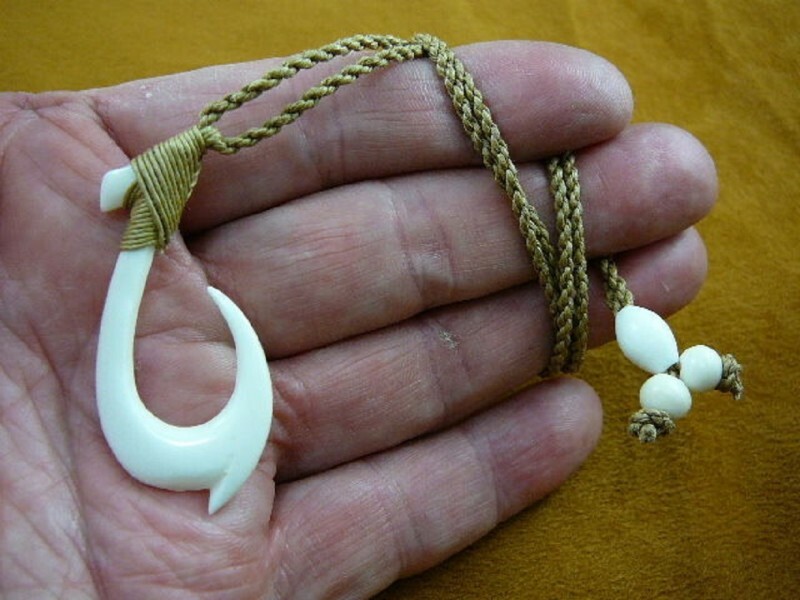 Hook itself is 1-7/8" long x 7/8" wide, natural cow bone, graceful flowing hook, drilled in one end for cording, on a 28" natural braided cotton cord, adjustable white bone beads to any length you need. Hook and necklace are woven together, not detachable. 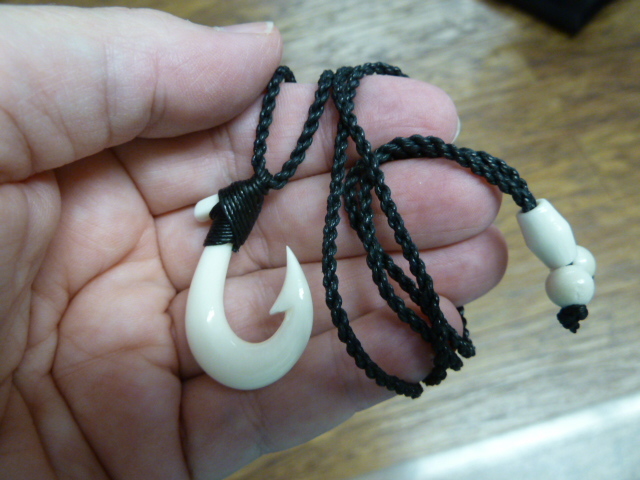 Hook itself is 2" long x 7/8" wide, natural cow bone, specially wrapped, on a 28" braided cotton cord, adjustable white bone beads to any length you need. Hook and necklace are woven together, not detachable. 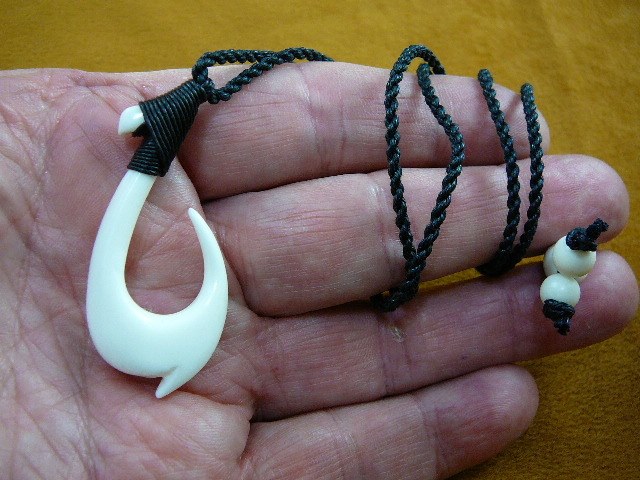 Hook itself is 2-3/8" long x 1-3/16" wide, Elongated, natural cow HORN, specially wrapped, on BLACK SMOOTH SLIDER cotton cord, 30" long, slide to any length you need. Hook and necklace are woven together, not detachable. 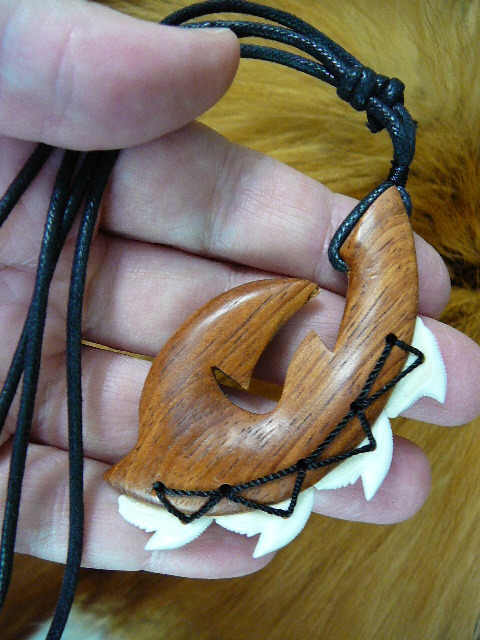 Carved of wood, inset with four genuine tiger shark teeth drilled and cord-woven to the wood hook. 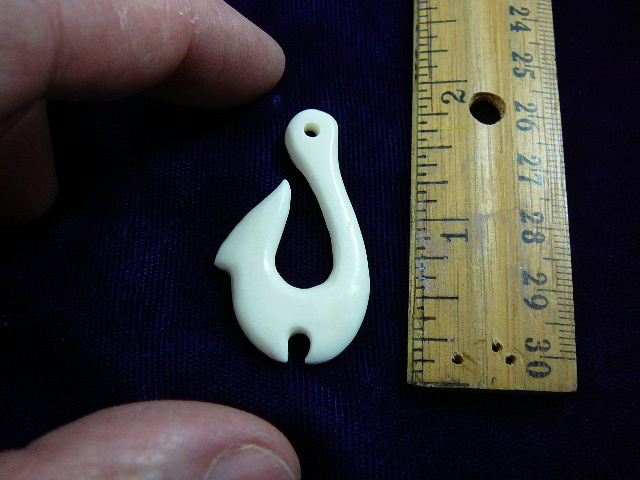 Hook measures 2-3/4" long x 1-5/8" wide x 3/8" thick, same look on back. Black cotton slider cord can be as short as you want, to 26" long; attached by knotted cording through a drilled hole in top of hook. 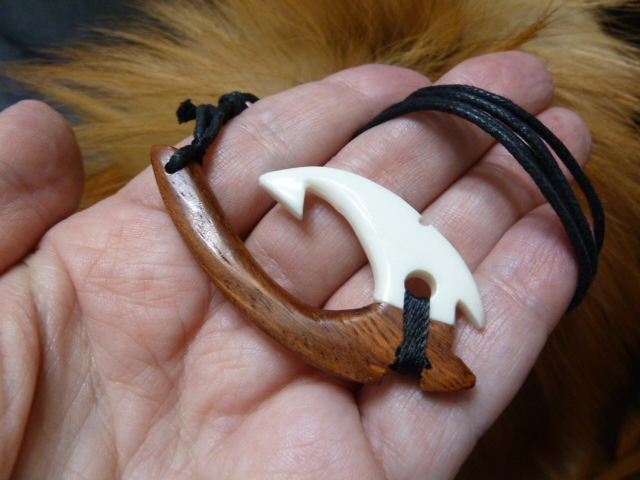 Natural KOA WOOD and WHITE COW HORN Hook (same on both sides) is 2" long x 1-1/16" wide. 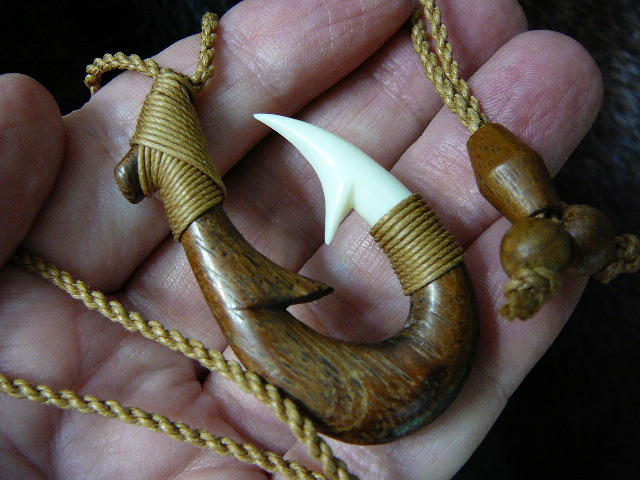 Hook is specialty wrapped to natural cotton cord around the top, and between the wood hook and the cow bone point; braided necklace is 28" long, adjustable wood slider bead, wood end beads. 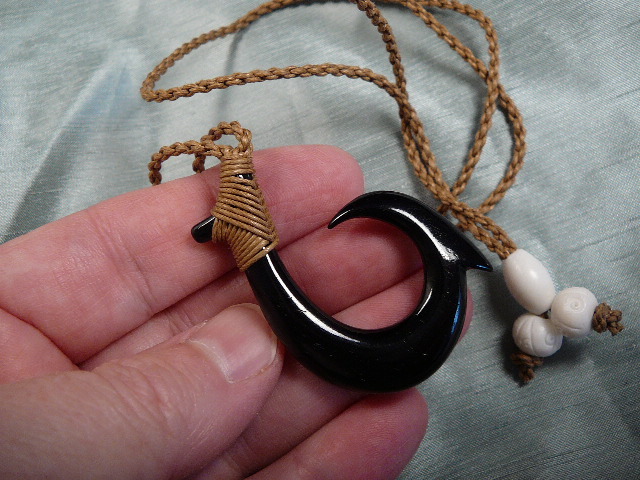 Natural KOA WOOD and COW BONE FISH Hook connected across the bottom with black cord, hole in top of hook with double cotton cord sliding knot, adjustable to any length to get over your head and wear comfortably. 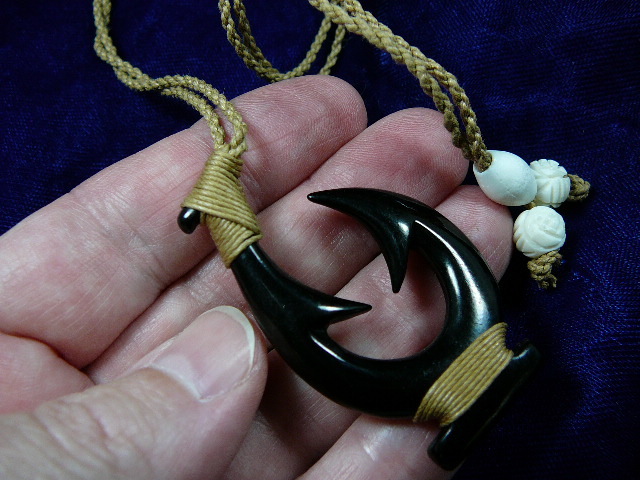 2-3/8" long x 1-3/16" widest, black cording between wood & mother of pearl, black cording knotted through hole at top of hook, black cotton cord with sliding knot any length up to 30" long. 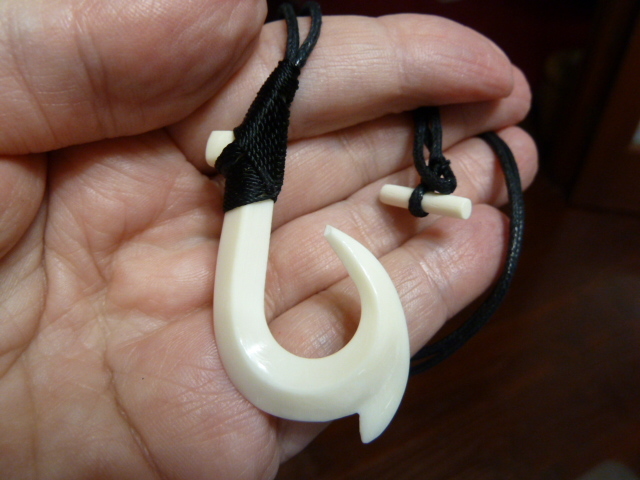 Hook is same on both sides. 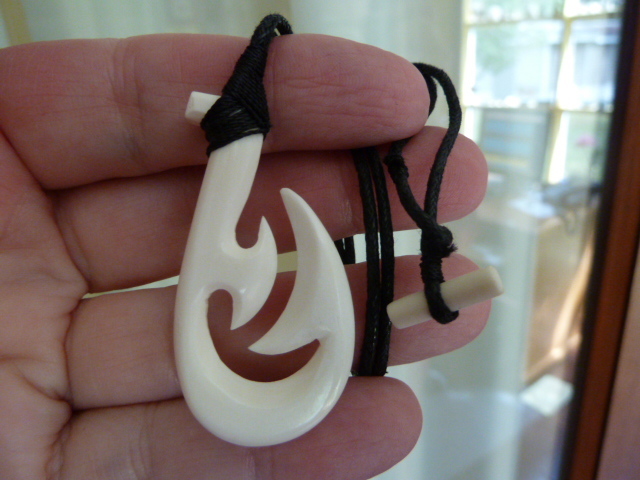 Maori with natural cow bone with insets of Rosewood fish hook necklace; 2-3/16" long x 1-1/8" widest, specially wrapped on BLACK SMOOTH SLIDE cotton cord, 30" long slide to any length. 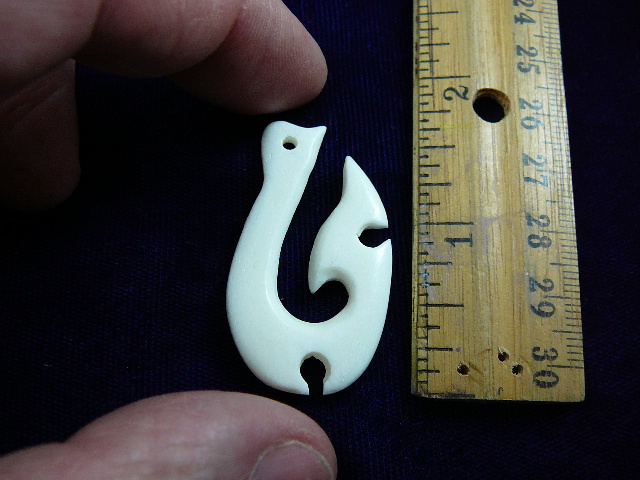 Hook is same on both sides. 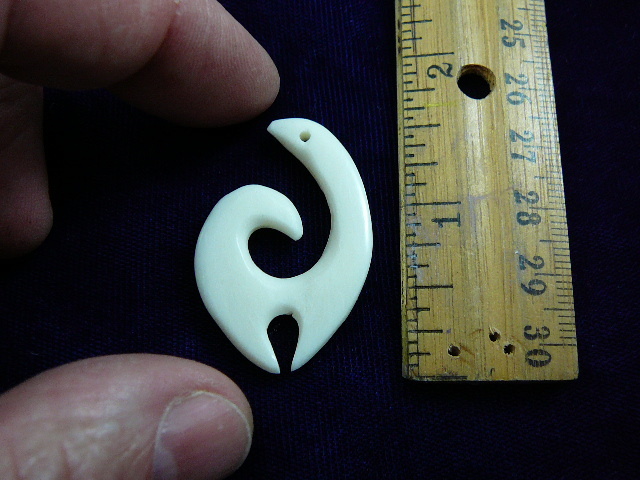 This beautiful Infinity pendant is hand made of either cow bone (white) or cow horn (black) and inlaid with paua (abalone) shell. The infinity symbol is believed to come from the latin word infinitas or "unboundedness." 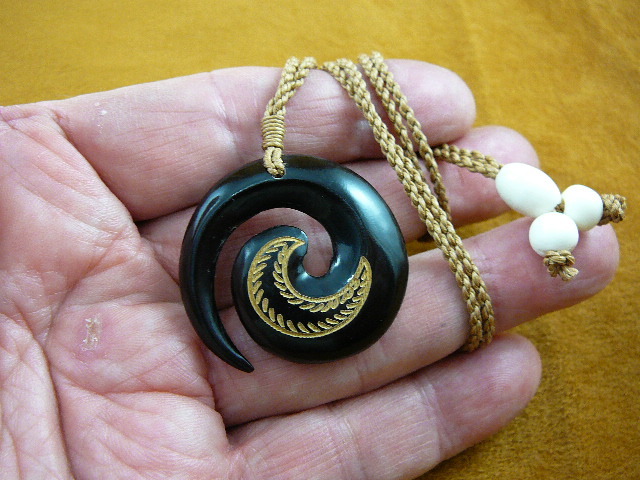 It's strong symbolism for eternity and love make it a unique pendant. Infinity to others represents a balance of force and holds a spiritual meaning. 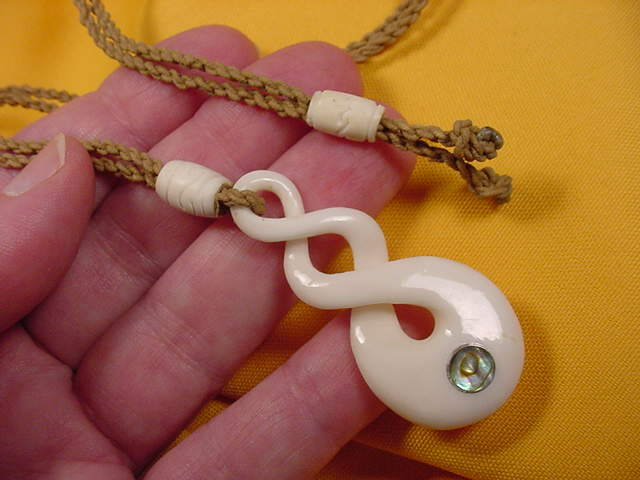 Graceful & smooth, this infinity pendant is 2" long, rounded on the other side too, inlaid with paua shell, on a 26" natural braided waxed double strand cord with sliding knot. Extremely well made and meaningful; Flat on back, on braided double strand waxed natural cording is a sliding knot necklace from 30" extended length to as small as you need. 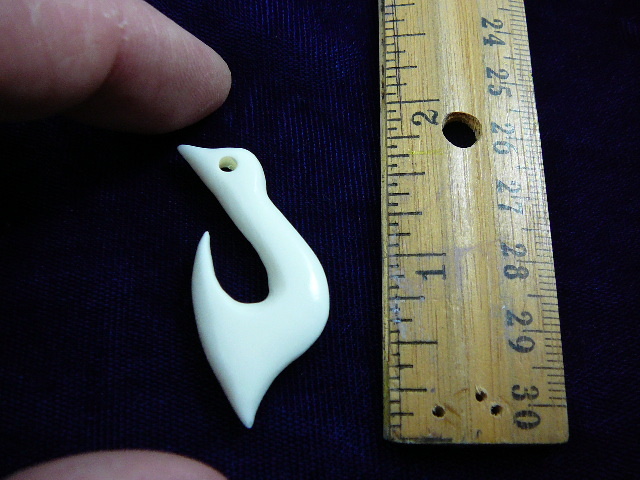 1-1/2" diameter. The CIRCLE is an ancient and universal symbol of unity, wholeness, infinity. Gnostic traditions linked the unbroken circle to the "world serpent" forming a circle as it eats its own tail. The circle symbol meaning is universal, sacred and divine. 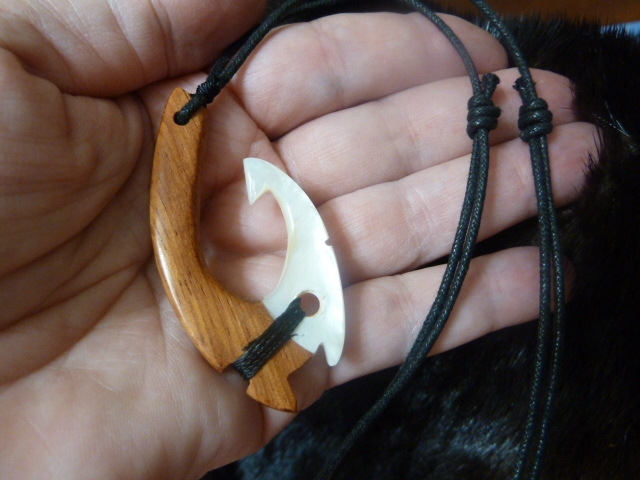 It represents the infinite nature of energy, and the inclusivity of the universe. Our ancient kin observed a circular aspect to the cycles of time, specifically in the movements of the seasons, the integration of energy and matter - spirit and man, combining for the purpose of greater spiritual understanding and evolution. Albert Einstein spoke indirectly of it when he said that energy cannot be created or destroyed; it merely changes form. Most often when one talks about the "Circle of Life", it indicates that everything in existence participates in this great cycle, including Earth itself. Your choice of any of the 4 below to make a dozen - Special Wholesale priced!